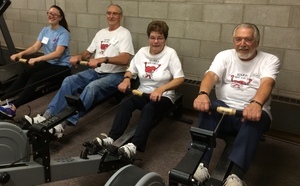 Founded in 1975 by Dr. Ron Fowlis and Professor Michael Sharratt, the Waterloo Regional Cardiac Rehabilitation Foundation Inc. (also known as Hardy Hearts) provides medically supervised, individually prescribed exercise training and education on healthy lifestyle modification for individuals who have cardiovascular disease. Our participants include those who have had heart attacks, heart by-pass surgery, angioplasty, or who are at risk of developing heart disease due to high blood pressure, high blood cholesterol, genetics, smoking, stress, and physical inactivity. Hardy Hearts offers these services to all residents of Waterloo Region. For more information, see the Hardy Hearts website or for questions regarding the program, please contact the program coordinators directly at 519-497-7049 or hhearts@uwaterloo.ca. "The Hardy Hearts program gives you a sense of security knowing that you are in a well supervised environment. The staff and participants are fun, friendly and just a great group of people to be associated with."